We wanted to follow the colors of the nursery. My sister did NOT want pastels (I completely agreed with her) so she went with navy blue, maroon, browns, etc. 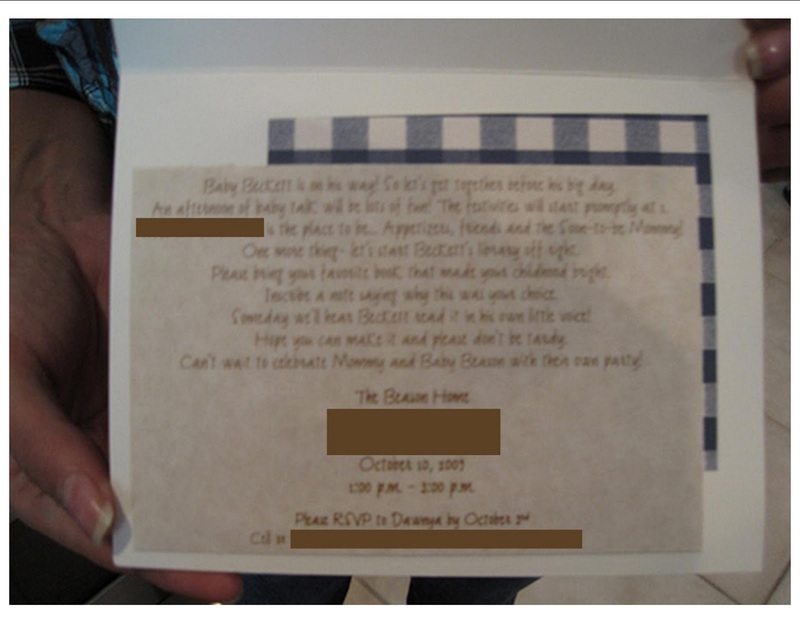 "Baby Beckett is on his way! So let's get together before his big day! An afternoon of baby talk will be lots of fun! The festivities will start promptly at 1. _______is the place to be...Appetizers, friends and the Soon-to-Be Mommy! One more thing- Let's start Beckett's library off right. Please bring your favorite book that made your childhood bright. Inscribe a note saying why this was your choice. Someday we'll hear Beckett read it in his own little voice! Hope you can make it and please don't be tardy! 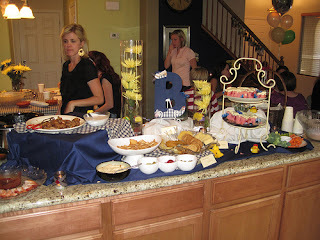 Can't wait to celebrate Mommy and Baby Beason with their own party!" 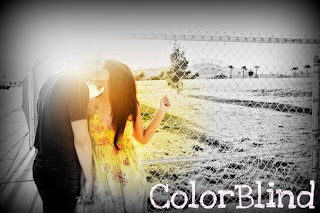 Shana had this great idea. 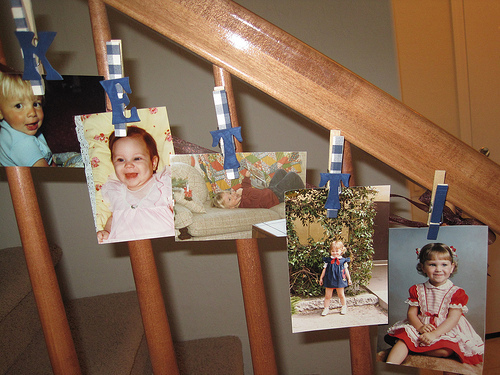 We glued the plaid paper to some clothes pins and painted letters to spell "Beckett." 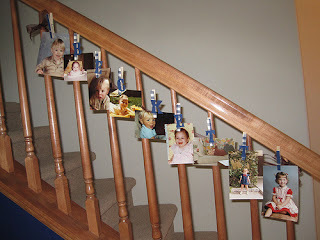 We pinned up baby pictures of the Mommy and Daddy. 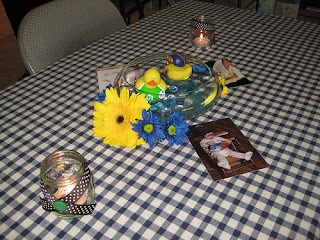 I didn't want the party to look too serious with all the plaid and buttons, so for the centerpieces, I bought some mini rubber duckies and had them floating in shallow glass bowls with glass beads in the bottom. 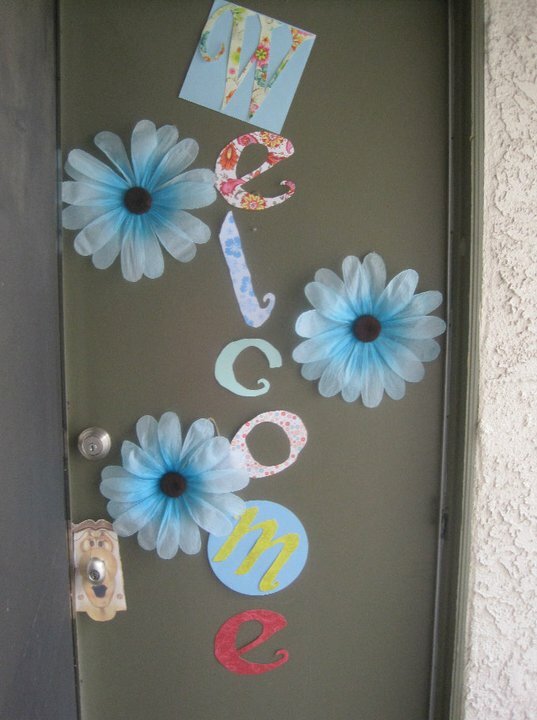 We adorned the outside with fresh flowers and more baby pictures of the parents. 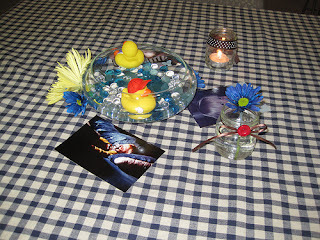 We also emptied out baby jars, glued on ribbon and buttons and used them as tealight holders. My mom found a navy plaid fabric and sewed table clothes for all of the tables. 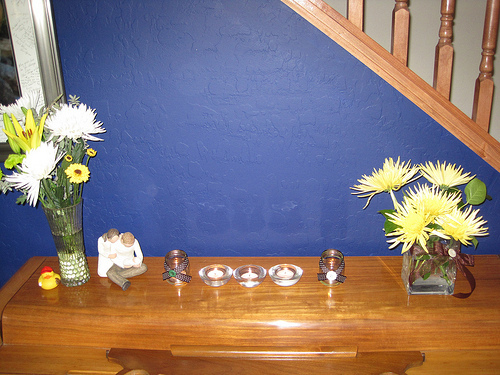 Here is a picture of the piano- more tealights and flowers. 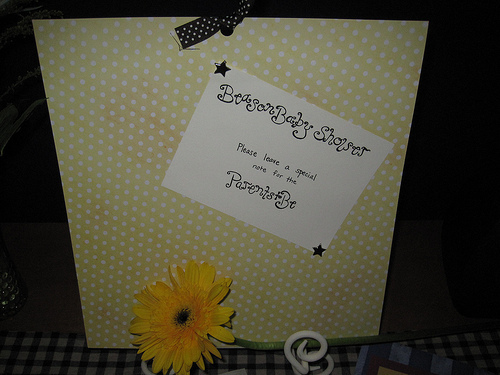 prepared scrapbook pages that we made. 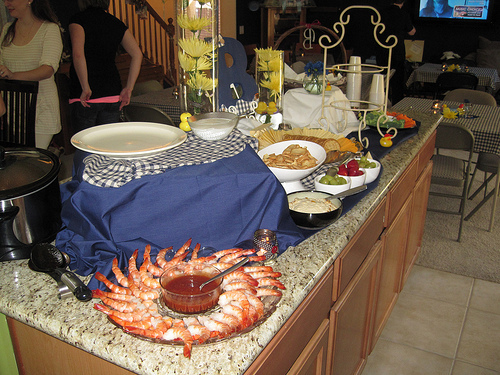 Here is the island in the kitchen where we displayed the food. Shana decorated a large letter "B" as the main focus of the spread. 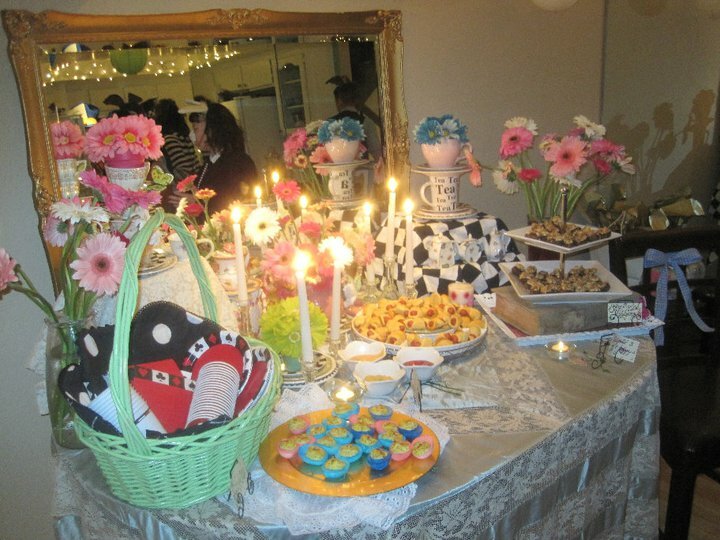 This was the first baby shower I have ever thrown. 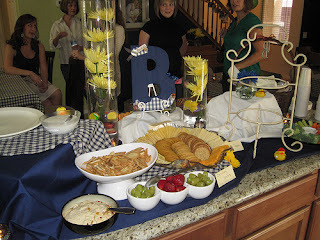 I couldn't have done it without Shana and I think everyone had a great time! 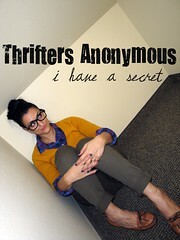 I've been talking about it and talking about it and I have finally decided to start a blog! I'm not sure which direction I want to go in, so I have decided to go in ALL directions. On that note, it seems only fitting to make my "Alice in Wonderland Un-Birthday Party" my first blog post. 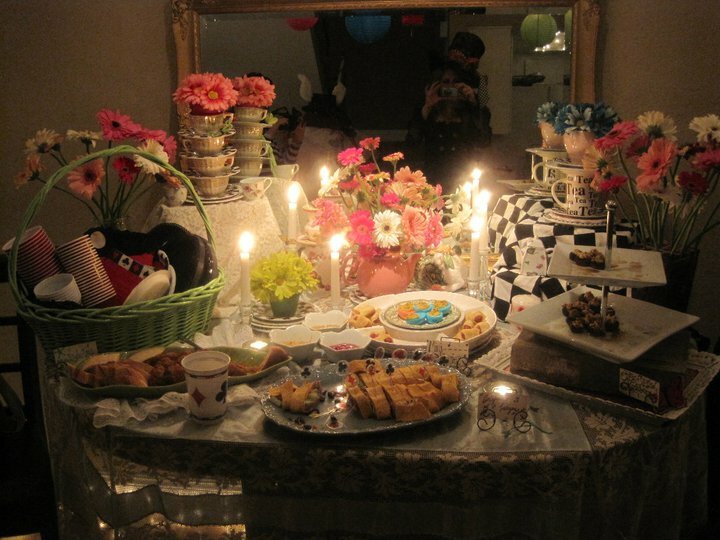 For my 31st birthday, I decided to throw an Alice In Wonderland themed party. This is something that has been swirling around in my head for the last two years. I've always loved Alice in Wonderland and I knew that I wanted to make this party special- down to the last detail. I spent months and months scouring thrift stores, looking for any sort of decoration ideas. Table cloths, old plates, fabric scraps, mismatched tea cups....with a little imagination, I created a beautiful tablescape without spending much at all. 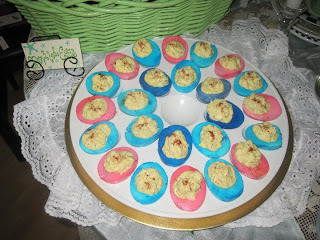 I decided to brighten up my deviled eggs but rolling the boiled egg whites in food coloring. They are placed on a normal deviled egg tray and then I placed them on a gold charger I already had. Below that is a lace runner that I found for only a couple dollars at a thrift store. I bunched it up to create a ruffled look. 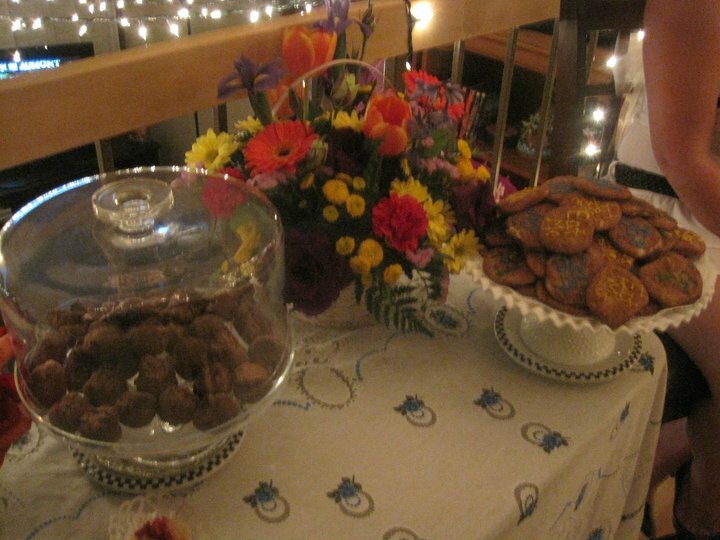 These are my Oreo Truffles and my Snickerdoodle Cookies. I piped the words "Eat Me" on each cookie. I also rolled my truffles in pink sugar for a subtle sparkle. For the table, I got the tablecloth from a thrift store for very cheap- maybe $3.00. I already had the glass cake stand and I borrowed the white cake stand from a friend. I found some amazing deals on teacups and saucers at local thrift stores. I stacked them to create a whimsical look. 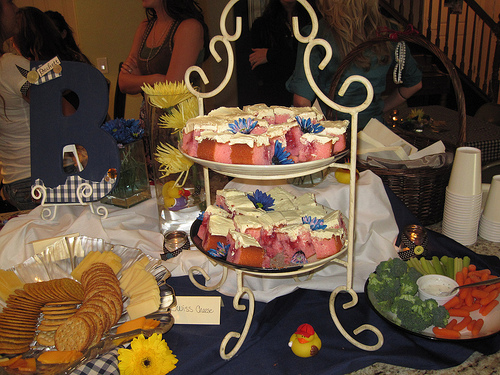 I also placed tiny butterflies on them that I already had from a previous craft project. 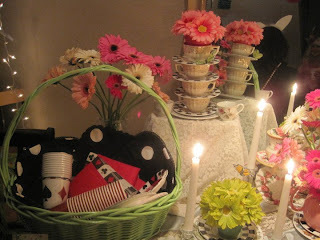 The teacups are sitting atop a lace tablecloth (thrift store) that I draped over an old box I had. I filled the basket (thrift store) with polka dot place mats (also from a thrift store). I ordered the paper cups and napkins through a party supply website. It had a casino night theme and I knew that would be perfect to add a touch of the "Queen of Hearts" to my table. 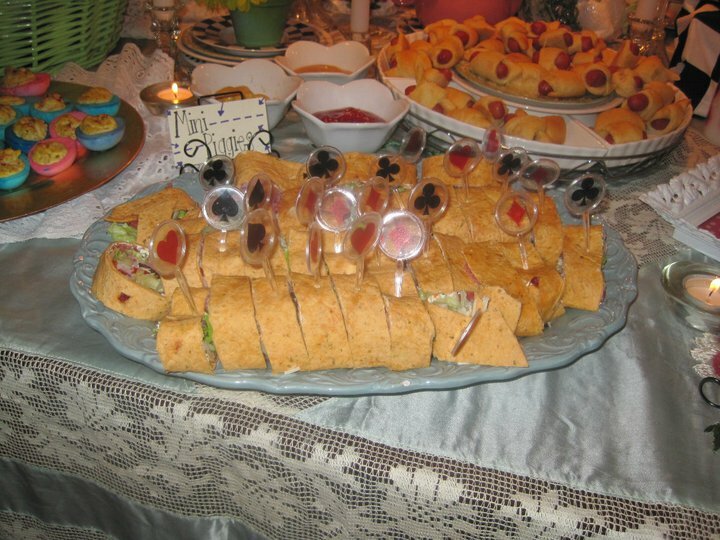 These wraps were a hit and I adorned them with casino night sandwich picks from the party supply website. They are placed on a platter I purchased at Marshall's. It was on clearance for $3.00! I also handwrote little place cards describing each dish. 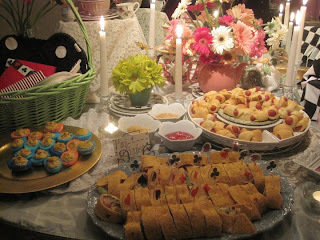 Yes, those are mini pigs-in-a-blanket....ALWAYS a hit at any party! In the back, I have a pink teapot (thrift store) and I filled it with fresh flowers. 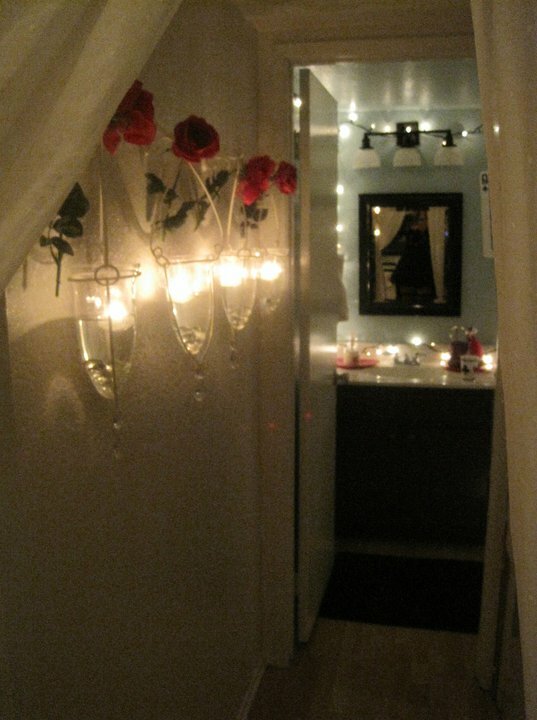 I placed white taper candles (Dollar Store) in glass candle holders (Dollar Store) for a bit of elegance. 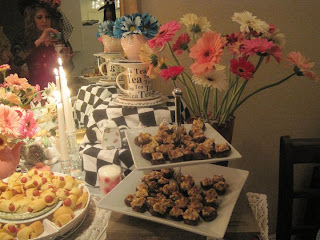 So, of course it wouldn't be an Alice in Wonderland party without mushrooms. I made Spicy Stuffed Mushrooms (Thanks, Aunt Paula!). 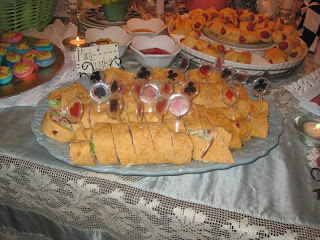 Here they are on my tiered platter. I actually turned the top tier slightly to create an unbalanced look. It is sitting on top of a box made to look like an old book. It was on clearance at Michael's. Behind the mushrooms are some fresh flowers in a vase I already had. 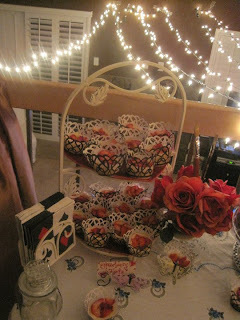 Next to that is another stacked teacup display on top of more fabric covered boxes. 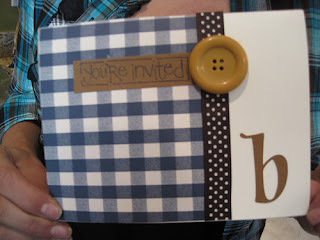 I already had the checkered fabric from a quilt I made. 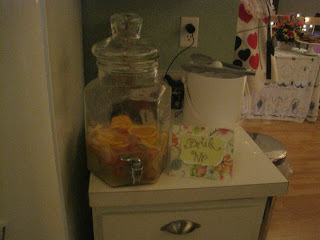 I made a white wine Sangria and used some decorative paper and a metallic marker to create a "Drink Me" sign. Here's a pretty picture from later in the night. I love the candelight and the mirror. Oh..the mirror is actual from my Grandma. She gave it to me years ago and I normally have it above my desk. I thought it would look great propped up on the table to create some dimension and give it a more "dreamy" look. This is the hallway to the powder room. I already had these hanging vases. I filled them with water and placed floating candles (from Michael's) in them. I also filled the base with heart shaped beads that I already had. I also added an artificial rose to the top of each one. 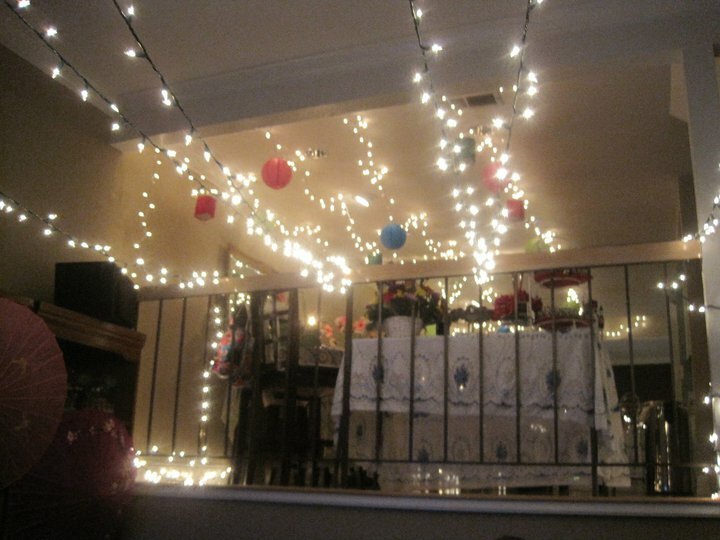 I strung white Christmas lights throughout the dining room and living room. I hung colorful paper lanterns (Michael's) on them. This is the product of being the daughter of a General Contractor. 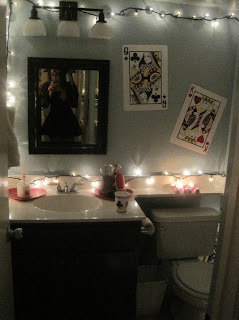 Okay, actually, this was a bit of a mess and my Dad would cringe if he saw how I put this together. It's a good thing that it's supposed to look "rustic." Haha! I bought the wood from Home Depot in their wood scraps section. All of this wood cost me less than $4.00!!! I bought some nails and used some old paint I had from college. Ta-dah! 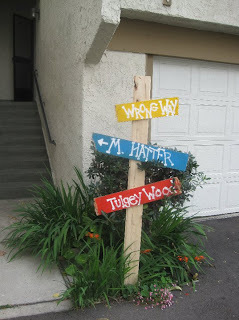 My Alice in Wonderland sign post! For the front door, I drew letters on different printed sheets of paper and cut them out. 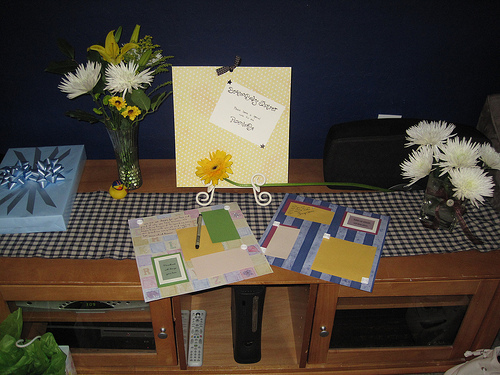 I bought these fabric flowers on clearance at a bookstore. They were $1.50 a piece. On the doorknob, I printed off a picture I downloaded from the internet of the talking doorknob in the movie. I glued it to cardboard and attached it to my front doorknob. Last but not least...my costume. I wanted to be the Mad Hatter. 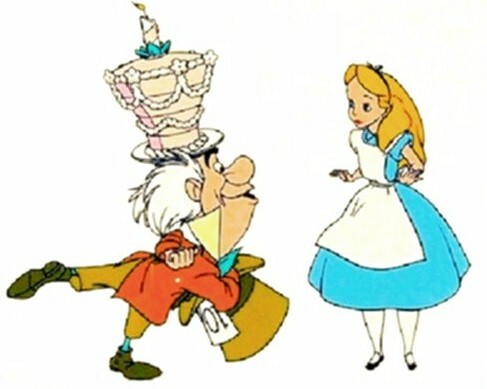 I really didn't want to make the entire costume, so I found the coat, hat and skirt online on a costume website. From there, I made changes. 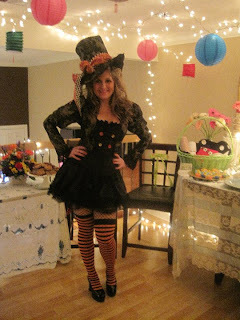 I added some buttons, borrowed a black corset from a friend, bought some fun tights and shoes and fashioned my own bow on my hat and on the back of the coat. 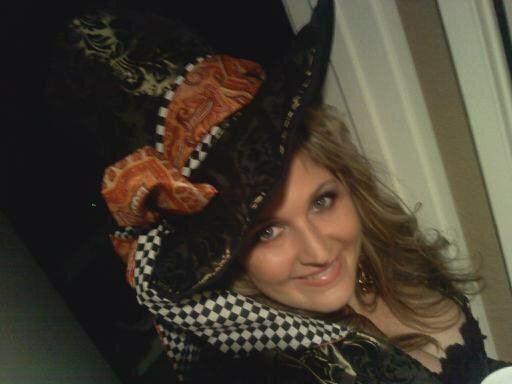 The hat originally had an orange ribbon. I purchase two different fabrics, cut them into long strips and sewed them together. (Ok, my dear friend sewed them for me because my sewing machine is pretty terrible.) Anyway, I tied them into a huge bow for my hat and a huge bow for the back of my coat where the tails were. I loved how they turned out!